Can you tell I love this image by QKR Stampede? Ü I have some new images coming soon, so you will get to see what fun challenge we have set for December. This layout is pretty simple as I wanted to be able to mass produce these. If you have pig lovers on your list this is the perfect and fun image for them. 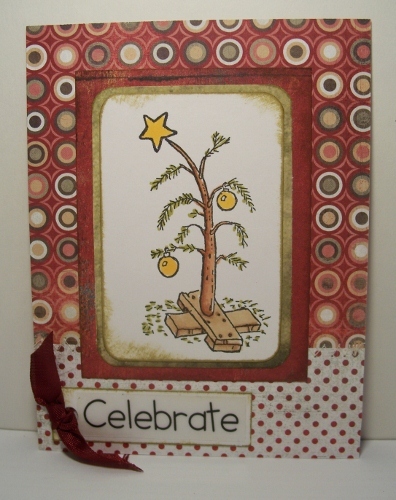 The image is colored with Prismacolor pencils and gel pen for the tree star and gift bow. Glitter was added to the star in the window and tree ornaments. Flower Soft was attached to the white on the Santa hat with tacky glue. To create a faux embossing I punched snowflakes for the bottom of the green base and attached with tacky glue. The stitching was done with a sewing machine and the buttons are hand sewn to the card. I hope your weekend is off to a great start! I have a bright fun card to share with you today. I made this with Snow Couple from QKR Stampede. I decided to have some fun with this one and stayed away from traditional winter colors. The border punch is by EK Success. The large snowflake punch is Martha Stewart and the small one is an old punch I've had forever that has no name on it. 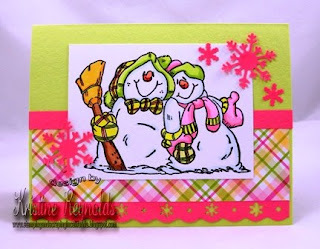 This bright, fun card is going to one of my friends on the East Coast some time soon. 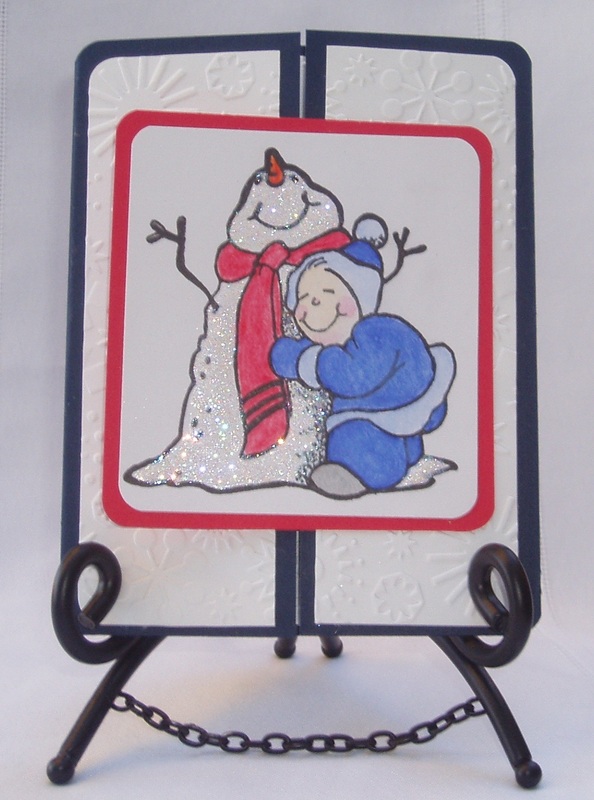 I know that when the snow is two feet deep outside this sunny card will brighten her day! I hope it brightened up your day too! This cold winter sky was created with the direct to paper technique, it’s very quick card to create and my tecnique is forgiving - if you don’t like your first swipe with the ink pad, just swipe it again and again until you do like it. The technique requires heat drying between ink applications and a gloss cardstock; 80% gloss was used for this card but I've done the technique with a high gloss also. Direct to paper means rubbing the ink pad on the cardstock. -Using the direct to paper technique with a swirl motion rub on the sky using two colors, lightest first and if you don’t like the first swipe continue until the line is to your liking. -Tear a piece of paper that’s larger than the image panel in half and form a mountain if desired. Mask off the sky area and direct to paper the mountains but don’t over saturate the paper with ink but if it does just take your landscape higher to cover the ink. -Use a second torn paper to mask the mountain area; the inks can overlap. -A third piece of torn paper was used to add the closest hill or I often use a piece that I’ve already used but at a different angle. -Stamp on the tree image, and to blend the image into the landscape I direct to paper black streaks. Now your ready to finish your card. -The blue panel was dry embossed and ink distressed. The envelope was create using the masking and sponging techniques. The insert has a partial image stamped to the left side only with the ink left on the image after stamping the envelope. Happy Thanksgiving to all our American followers. I hope you are enjoying your holiday. I am cooking today...that once a year I cook a turkey...lol. It will be just my mom, and my DH and my DDs for dinner here today. Then we are off to go over the river and through the woods to Grandma's house. Well, I guess it is more like over the Thruway, and down the expressway...but you get the idea. Well today I wanted to share something a little different then my normal posts. I decided to make a LO page today. Now, I don't have photos on it because it is my Thanksgiving page for this year...lol. BUT you can see where the photos will be after I take them today. I was inspired to make a page using the LEAF image from the QKR Stampede store when I saw my fellow DT member, and crafting friend Kristie made a LO using this stamp. I think most of us DT ladies have this stamp...it is just so pretty. I started with a brown PP base. The rest of the PP you see on this page (circles and letters) are from CTMH. 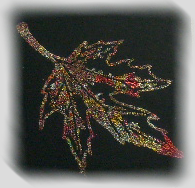 I then added 2 of the LEAF images to this page. Both of them are ones I stamped off before using the baby wipe technique. I keep forgetting I was going to do a little photo tutorial of this technique on my blog...lol. Maybe if I remember to buy some baby wipes, I will remember to show how to do it. Anyway, I will not keep you any longer today. I am off to get that turkey in the oven, and watch the Macy's parade! I hope you have a very blessed holiday! OH...and we would love to hear what you are thankful for this year. I am thankful for so many things, but mostly for my wonderful supportive family. I began my "weight loss journey" back in July. Well, my husband and my girls have been nothing but helpful and supportive through the whole thing. So, today I am thankful for their support and encouragement to help me get to my first goal, and keep going. I am currently 1/2 way to my 2nd big goal! Leave a comment and let us know what you are thankful for. I can't wait to read your comments! Hi, it is me Dawn ! 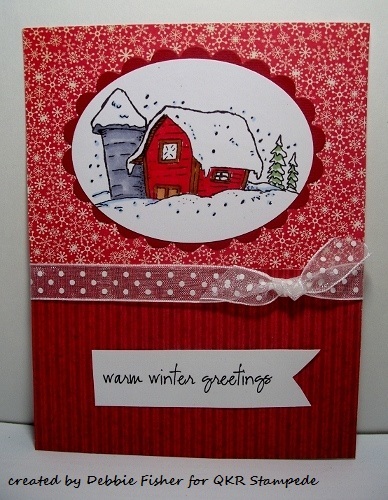 I am here to share a fun card using a QKR Stampede red rubber stamp.I have included a couple pictures of the same card because I noticed some glare. I want you to see the dimension on the nest- yes the turkey is hiding out up in a tree- in a nest! Wouldn't you be hiding if you were a turkey the day before Thanksgiving? I thought this turkey was so cute- seemed like he needed to be roosting somewhere like a nest.I actually cut one apart to add to the card. Yes, some American moss for padding for the turkey. I colored this adorable tom turkey with Copic markers. Cut out and pop dotted for dimension. I used this thick paper I had in my stash that actually looks like wood. Ran it through my Big Shot with a Tim Holtz embossing folder. Love that grain of the tree. The leaves are from a punch and the tweet tweet is from a mini alphabet set I own. We have here in Germany in the next time winter, it gets cold and this week it is still snowing. Time to think now about Christmas. For this week I've decided to Santas Helper. I love this little turtle, this is so adorable. The card with a few beads and glitter together and finish is a typical card in the traditional christmas colors. On the hat I have applied ice crystals that can be seen but unfortunately not in the picture. Hi everyone! It's Jerusha here, bringing you a quick and easy gift idea for the teacher or co worker or neighbour on your list. Why not make them a package of cards? Everyone can use some blank cards for birthdays, thank you's, etc. Today's project is the perfect, easy gift idea! I made these cards using the Smiling Sun stamp from the store. It is bright and cheery and is sure to bring a smile on the face of the recipient. I guess it is kind of the gift that keeps on giving! They are really basic and easy to put together. I think the whole lot only took about an hour to make and then an extra few hours for the glitter to try. It's a fun and easy way to bring a smile to the face of someone on your Christmas list this year! WELCOME to the QKR Stampede "12 Blogs of Christmas Blog Hop"! We are so excited to show you what we created for this FUN Blog Hop and SO glad you have come to join in on the FUN! This is where it ALL BEGINS! So sit back and enjoy some Inspiration from our Design Team made with the CUTE and QUIRKY stamps from QKR Stampede! We have 12 fabulous DT blogs for you to hop through and see the awesome Christmas inspiration there for you. 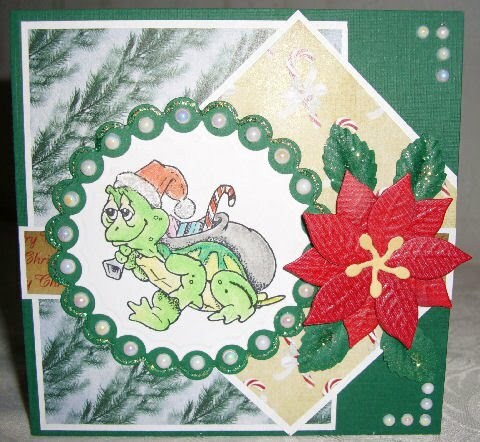 Now Hop along to JERUSHA's , and enjoy the "12 Blogs of Christmas"!!!! Hello crafty friends! Today I have an adorable gate fold card to show you. 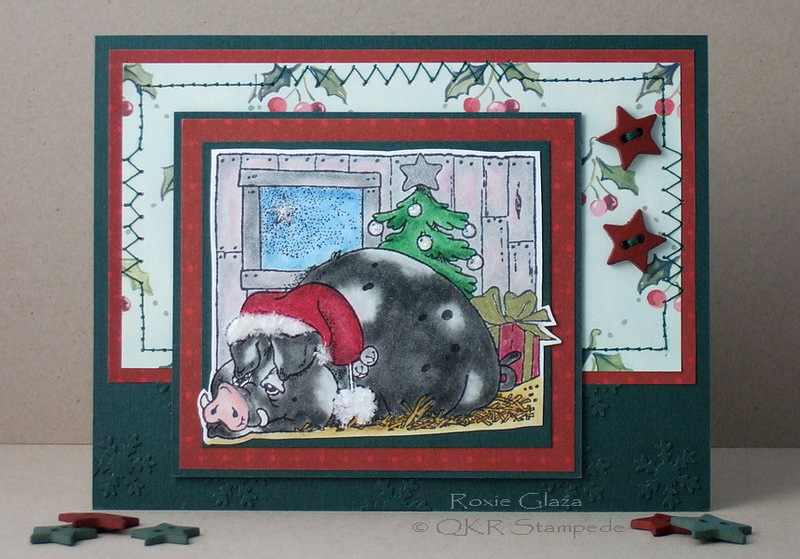 I used the Best Friends stamp from QKR Stampede for this card and I think it is just a darling image. I stamped Best Friends onto white card stock and colored it with water color pencils. I then used a glue pen to add glue to the snowman and covered him with glitter. The image was then layered onto red card stock. 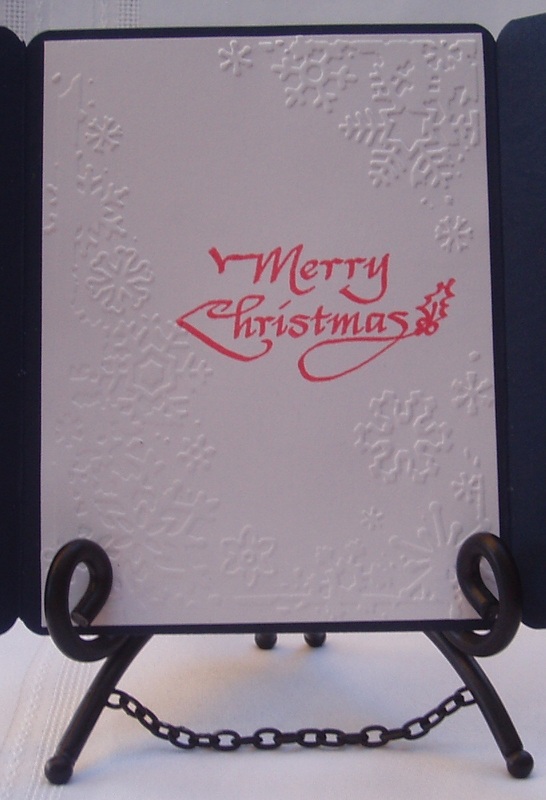 For the inside of my card, I ran a piece of white card stock through the Cuttlebug with a different snowflake embossing folder. I can't find this one on the Provocrafts site, it came in a set and it may be a discontinued set, as I don't see any of the ones in that set on their site. 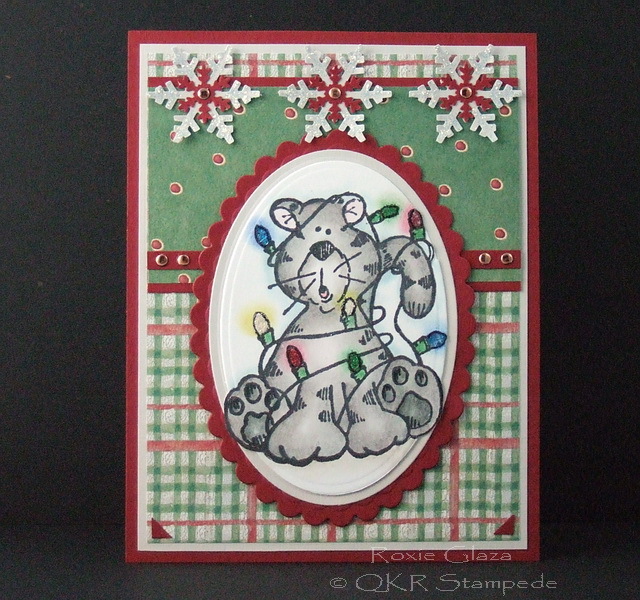 I stamped the Merry Christmas sentiment with another QKR Stampede stamp with Memento Lady Bug Dew Drop Ink. Thank you for stopping by, I hope you have enjoyed todays project. Be sure to come back tomorrow, we will be having our Christmas/Winter Design Team Blog Hop and you won't want to miss any of the wonderful projects our design team ladies have come up with. QKR Stampede called Selling Snowflakes #14214. I started with a 5" square card. Background paper is from Cosmo Cricket mini Deck Mitten weather. 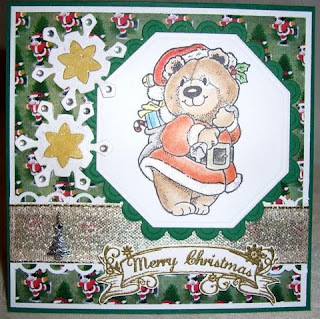 I used my Lacey Squares Nesatabilities die cuts. Antique Linen Distress ink to give a little dimension to the image. Liquid applique and some glitter sparkles the snowman up! Here is my second take on this adorable Perfect Christmas Tree. I just love this primitive little tree! I don't know about your corner of the world, but here in northeast Ohio, we had a beautiful Fall weekend (certainly to be one of our last), which inspired me to make this card. I used the QKR Stampede Leaf (#3901) and Hope Forever (#22801) stamps to create this card. 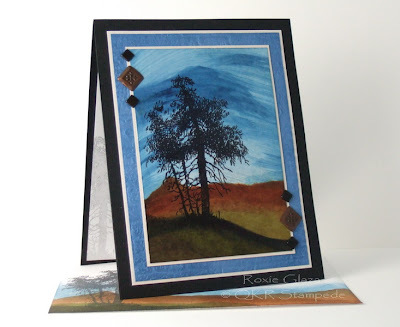 The background of my card was stamped with the Leaf stamp and a Kaleidacolor stamp pad. 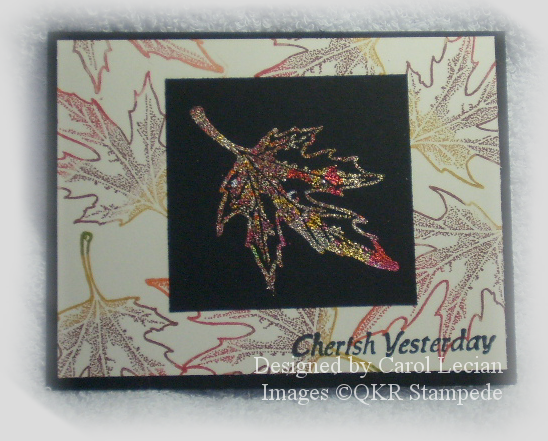 For the focal image, I again used the Leaf stamp with foil and QKR Stampede's new line of Sticky Powder (some of you may recognize this product as Sticky Embossing Powder, or Heat-n-Stick powder). Being that Fall is quickly leaving us, I decided that the Cherish Yesterday sentiment from the Hope Forever stamp (which is actually a collection of four sentiments) was perfect for this card. Here is a close-up of the foiled image; as you can see, the result is absolutely stunning! 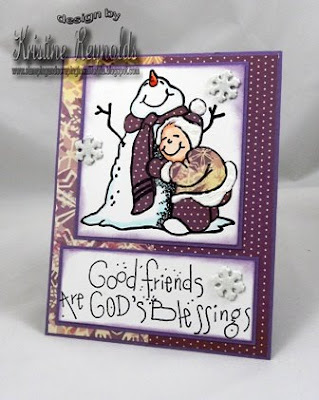 Today I have a card that I made with "Best Friends" by QKR Stampede. The patterned paper is Cosmo Crickets "Mitten Weather". I did a little paper piercing for this fun card. The sentiment is from QKR Stampede too. I hope you are having a great weekend and appreciate your stopping by to see us! If you’ve ever owned a pet chances are you’ve seen a similar scene in your own home like the predicament this kitty got into. The lights were battery operated in this scene so kitty was never in any real danger! -Prismacolor pencils, baby oil and paper stumps were used to color the image using the Gamsol technique. Baby oil replaces the Gamsol/mineral spirits. -To give the appearance of the lights being lit - color the bulbs with Prismacolor pencils and blend it out of the image. Click here for the Sticky powder tutorial. Tip: if the outline gets covered with the embossing procedure it can be defined again with a permanent marker. Other techniques used: out of the box with Nestabilities for the image panel, Stickles for the large punched snowflakes and Diamond Glaze for attaching the nailheads. Hi there. I am happy to be able to share a QKR Stampede card with you today. I have been in a bit of a creative slump lately. I have been struggling to come up with ideas lately, but finally after about a week of no creativity, I was able to put a few things together. I think my creativity has returned...lol. I will let you be the judge. Here is a card I made using the Med. Winter Moose Image. This moose is just so cute! I love his smiling face. I stamped him with close to cocoa ink, and colored him with watercolor crayons. I added some white fun flock to the puff ball on top of his hat. I have to tell you a little phobia of mine...PUFF BALLS...lol. Since as long as I can remember I have never liked puff balls on hats. I also can't stand those pompom balls you can buy at craft stores too. Something about them is so gross to me...lol. I was kinda surprised with myself that I took the time to add flock to his hat for this reason. 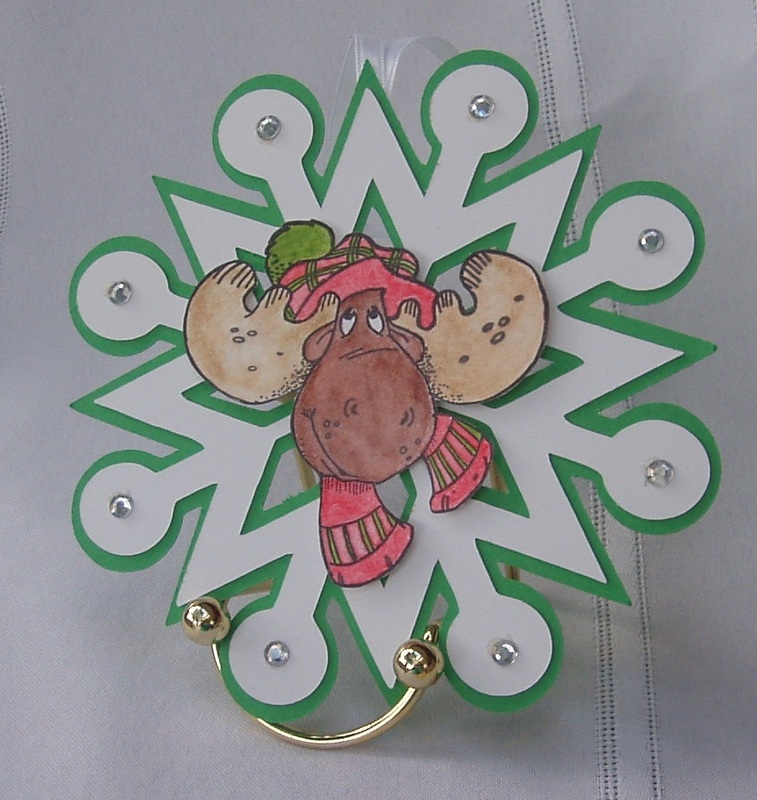 Ok...back to the card...I layered Mr. Moose onto some PP from SEI, and added the little brown "pearls" to the corners. I didn't add a sentiment this time because I thought it was cute just this way. Well thanks for stopping by. Have a great day. Don't forget to stop back regularly to see what all the talented DT ladies have created for your eyes. AND...we have another blog hop coming up on Nov. 19th. Be sure to join us! Today is another QKR Stampede posting day for me. Wow the weather has changed considerably in our area but I still have pumpkins on my mind-How about you? When I seen this great big pumpkin vine stamp I instantly thought of Charlie Brown and his friend Linus waiting for the Great Pumpkin to come. 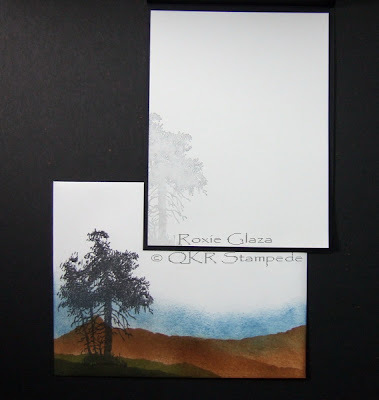 These are the last stamped images I colored with h20's- have you tried any yourself? I bet you know I cut and pop dotted this image one more time- love the fussy cutting. Decided to emboss the background with a Cuttlebug embossing folder- reminds me of sticks.This paper is from CTMH and unfortunately discontinued- they might offer again during one of their clearance sales. Not sure if you noticed the reverse scallop on the bottom? I like to try different things to achieve texture. Ribbon is from one of my favorite ribbon places-Really Reasonable Ribbon. Added a little ticket from my stash, also a safety pin from CTMH. I tried many times to get a better shot of this great pumpkin vine stamp. There is gold leafing used to make this stamped image completely different. Can you see all the texture and shine? The card is so much nicer in person. Ribbon from Really Reasonable Ribbon-I also added some sequins to make this pumpkin shine. All card stock from CTMH. Well Thanksgiving is almost here but I couldn't resist one more pumpkin card- just loved this pumpkin stamp. Do you make Thanksgiving cards? Why not pop into the gallery store and pick up a stamp or maybe even a digital image to finish up those cards. It's already Tuesday and time for me to show you a card. Today I decided me for the cute image of Santa Bear. For me is Santa Bear a girl and not a grumpy old bear ;-). On my blog I have had in the past week exactly the same image, just embossed. That was not bad, but not nearly as beautiful as when the picture is colored. Unfortunately you can not see that the snowflakes are glittered and the white areas of coat and hat. Hi everyone! Thought I would share a funny card with you today. I live in Canada, where we have snow for about 6 months of the year (seriously!) It arrives in November and is not fully gone until May. It's rather disconcerting, especially if you are someone like me who does not really like snow. Who am I kidding? It is about February when I look out the window and see the snow and the grey skies that I feel like sticking a broom in a snowman. And maybe I will! My card share with you today uses a QKR Stampede stamp Stockings Hung, it's a cute stamp and goes great with Basic Grey Jovial papers. Good morning to you all, today I have a Christmas Card to show you, the image I have used is called Nightime Bear and can be found HERE. I fell in love with this one as soon as I saw it and couldn't wait to colour him which I have done with Copics. I used a rounded corner punch to soften the edges, the bp is from Elusive Images, I also added ribbon, flowers, gems, pearls and sentiment. I know that I will be using this cutie many times this Christmas so keep an eye open. Today I'm showing you a moose ornament that I made with Medium Winter Moose stamp from QKR Stampede. This image measures 3" x 3" First, I stamped it onto white card stock, then colored him with my watercolor crayons. I used my Cricut Expressions to cut the snowflake, the white on the basic snowflake setting and the green on the shadow setting. After I fussy cut the Winter Moose, I used foam tape to attach him to the snow flake. Then added self adhesive gems to give it a little 'glitter' There is satin ribbon added to use to hang the ornament. I think he is adorable. What do you think? Thanks for stopping by today, I hope you have enjoyed your time here and gotten a little inspiration. These kinds of ornaments could be made with so many of the wonderful QKR Stampede stamps. 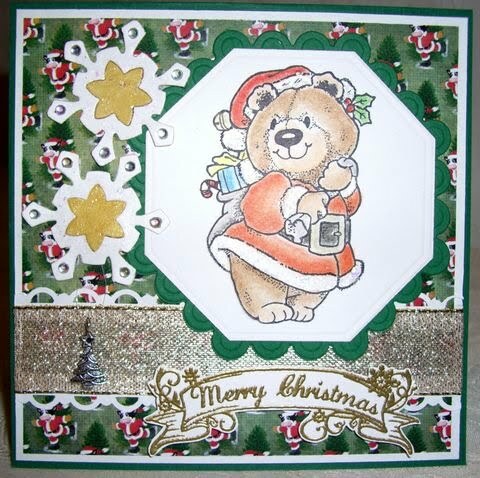 There are LOTS of great Christmas and winter images, in rubber stamps as well as digital, that would work great for this project. I hope you will stop by and see what you might like. Today's post is coming to you from Minnesota! For my card today I used the stamp Dog Bath #1801. I colored the image with colored pencil. Bubbles are simply lots of glitter! Background paper is from October Afternoon. I'm almost afraid to post this! We have been having BEAUTIFUL fall weather! I don't want it to end. I'm hoping I don't "jinx" the lovely fall weather and end up with snow. I do love snow, but AFTER Thanksgiving. Then I'm ready. I'm kinda picky that way. LOL!! 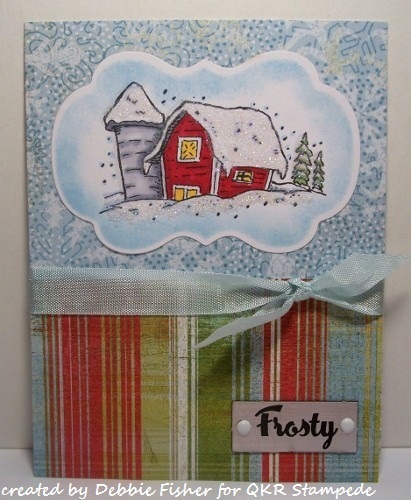 This image is called "Snowy Barn" by QKR Stampede. (digi image available here). Our barn is red, so I had to color this one red as well. I love old red barns! I added lots of glitter to make the snow look like it was glistening.